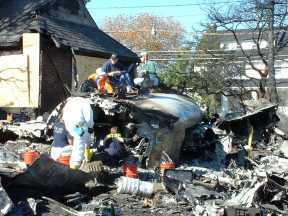 (June 4, 2002) -- The National Transportation Safety Board (NTSB) today released an update on its investigation of the American Airlines flight 587 crash (November 11, 2001) involving an Airbus A300-600 taking off from NY's JFK Airport, which fell into a Belle Harbor, New York neighborhood killing all 260 persons aboard in addition to 5 people on the ground. 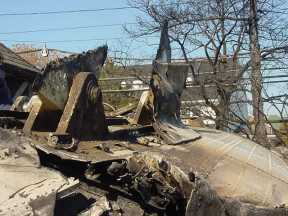 The crash was the second deadliest in U.S. aviation history and its cause remains a mystery. NTSB has released a compilation of summarized witness statements (below) and announced that high tech testing on parts of wreckage is continuing. The NTSB also voted to convene a public investigative hearing on the crash in Washington, D.C. in October (exact dates and issues to be announced). 52% specifically reported seeing a fire while the plane was in the air, with the fuselage being the most often cited location (22%). Other areas cited as a fire location were the left engine, the right engine or an unspecified engine, and the left wing, the right wing or an unspecified wing. 8% specifically reported seeing an explosion. 20% specifically reported seeing no fire at all. 22% reported observing smoke; 20% reported no smoke. 18% reported observing the airplane in a right turn; another 18% reported observing the airplane in a left turn. 13% observed the airplane "wobbling," dipping" or in "side to side" motion. 74% observed the airplane descend. 57% reported seeing "something" separate from the airplane; 13% reported observing the right wing, left wing or an undefined wing separate; 9% specifically reported observing no parts separate. More complete observations will be published in the Witness Group's factual report when the public docket is opened on the first day of the public hearing. [A]t NASA's Langley Research Center in Hampton, Virginia, two panels measuring approximately 6 feet long and 2.5 feet wide were removed from the vertical stabilizer from flight 587. They are the lug-to-skin transition areas for the left side forward and rear lugs. At the Safety Board's request, the Ford Motor Company has offered the use of its nondestructive evaluation laboratory, which is considered one of the most advanced laboratories using CT scanning in the world. The panels are currently at the Ford facility, located in Lavonia, Michigan, undergoing CT scans to generate images of ply separations noted in earlier examinations. Most CT scanning equipment cannot accommodate the size of these panels. The scanning should continue for another week or two. Also at Langley, seven additional coupons (samples) from undamaged areas of the stabilizer were removed for materials testing: four from the left skin, and one each from the aft spar, center spar and lower rib.